I knew it was a stupid idea, but at least I had a backup plan. 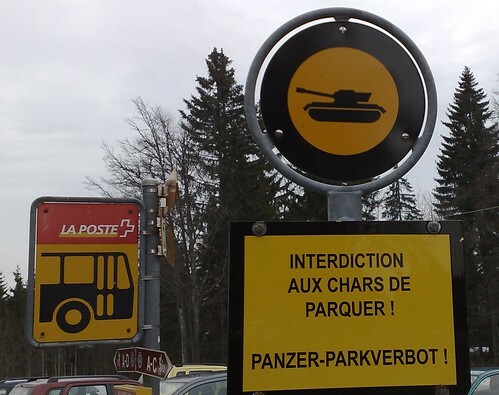 Oh, and no parking your tank here! The idea was to climb Mont Tendre in the Swiss Juras. 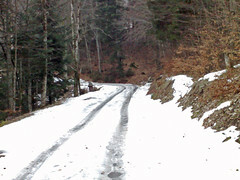 It’s a well known little road up to just below the highest peak in the Jura Mountains. Being in Switzerland, this single lane path through the woods is in perfect condition. I was hoping it might have been plowed, but no luck, and by the time I reached 1,100 metres it was just too steep and icy to continue – miles short of the top. Glance at the elevation chart above, it’s not only a beautiful route, it’s STEEP. Another summer project. So I descended back down and cycled up the far easier Col du Mollendruz (backup plan!). It’s an ok climb but a fast road with the occasional truck. Most other places it would be a great ride, but there are so many traffic free choices in the area – and in fact up high, the area was littered with mountain bike signs. A couple of other points on the photo. Notice the “La Poste” bus stop sign. 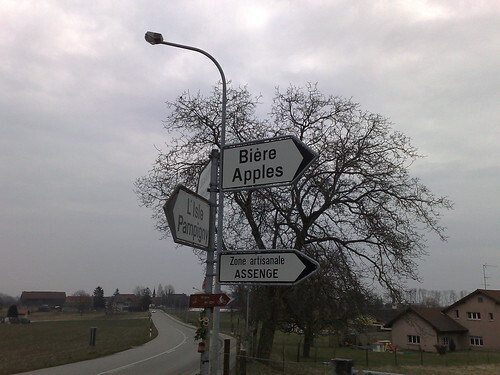 In rural Switzerland, the Post runs most of the public transportation. In fact, if you are touring in the Swiss Alps and just can’t climb another mountain, the Post buses will happily give you AND your bike a lift. The national cycling route web site even suggests a few places where a bus lift might improve a cycling Tour. 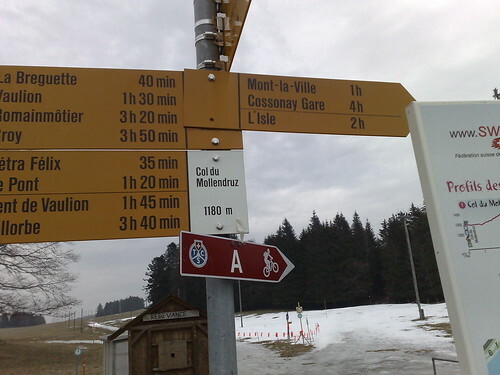 Also note in the photo below the La Poste sign are arrows for four Mountain Bike routes. Paths everywhere here through beautiful country. Well… I think if you had been in your tank you could have contuinued up Mont Tendre and not have to climb Col du Mollendruz instead. 🙂 Great picture! I don’t know (yet) Col de Marchairuz but I will try it from the route you suggest.